Now it is time to Get Connecticut out of the Rut. That’s right. We are in a rut. We talk about all our past achievements. Remember Rural Free Delivery, and the gavels and gimmicks that brought 200 Grangers to various halls on a regular basis. Remember when your Grange took in 20 or 30 candidates on a degree night. All of this is great. It is all part of our past -- a part of our history. Now, let’s get out of the rut. Let’s talk about our future, not our past. Let’s develop local subordinate grange publicity about the positive things we are doing each and every day. We need to brag. If you think you don’t have anything to brag about, think again. Did your Grange enter the Community Service Contest last year? Write articles for your local papers about your Should Auld Acquaintance programs at the convalescent homes. Not only does it give you some much need publicity, but the residents enjoy reading about themselves in the papers. What about the CWA Contests? Do you enter them? Do you publicize the Needlework Contest? There are still a lot of people out there who have the time and the talent to enter. Are you sponsoring a speaker from the legislature or from your local government? These speakers would love the exposure and we will benefit from the publicity. How about your fair? Do you possibly bring agriculture to an area where cows, chickens and rabbits are a rarity. Schools sponsor trips to working farms as a part of the education process in our elementary schools. Times have changed! Publicize what we take for granted. Many suburban parents think a petting zoo or a friendly goat or a couple of sheep are worth knowing about and exposing their children too. Help them and help yourself at the same time. Put the past into the proper prospective and challenge the future with positive publicity. 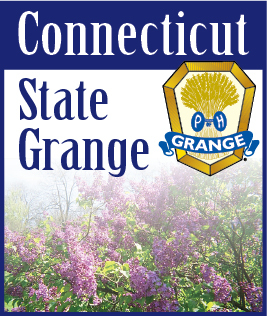 HELP US GET CONNECTICUT GRANGES OUT OF THE RUT.